I’m using the MCUXpresso IDE v10.0.2 in this, but basically it should be the same for any other Eclipse CDT distribution (e.g. Kinetis Design Studio or others). Referencing another project will check and build the referenced projects. As for above, if I build the project ‘C’, it will go and build first ‘A’, then ‘B’ and finally ‘C’. The think is: this only triggers running the make process for the referenced projects. It will *not* trigger a make for the ‘C’ project if one of the referenced projects is changing. I still have to run the build/make for the ‘C’ project. Now one would think that this is all what is needed: with the libraries listed in the linker options, it will relink the application if one of the referenced libraries? Actually this is not the case :-(. It will only build and relink the project if a file of the project itself has changed, but not if a referenced project has changed. 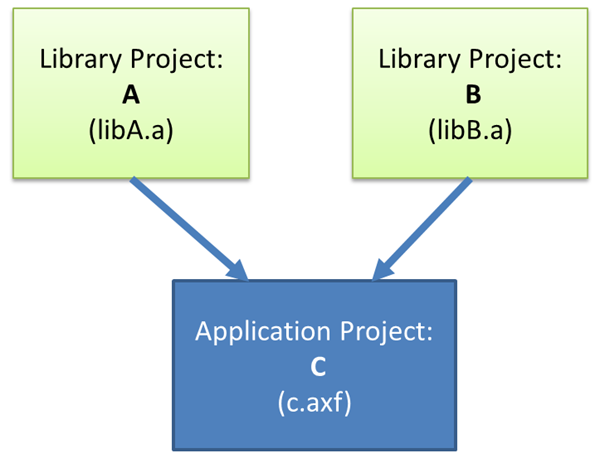 The rule for C.axf only depends on the project object files plus any user object files. The target C.axf does *not* depend on the $(LIBS) which I have specified above in the linker options. 💡 see Tutorial: Makefile Projects with Eclipse for a more detailed view about make files and make rules. With this: if I build the ‘C’ project and the ‘other objects’ have been changed, it will link them. 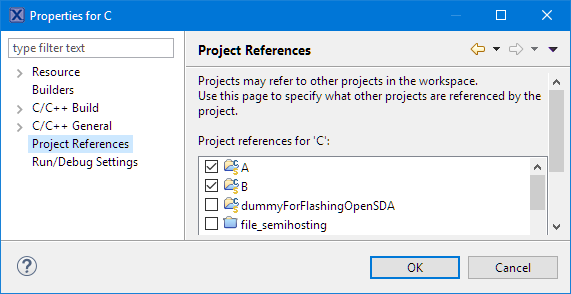 I can use the ‘Project References’ setting in Eclipse CDT to reference other projects. Eclipse will call make for the referenced projects when I build the ‘master’ projects which is a handy thing for library projects my application depends on. In order to trigger a re-linking of my master project if any of the depending projects have been changed, I have to specify the libraries in the ‘Other objects’ settings. Then everything works as I would expect it. 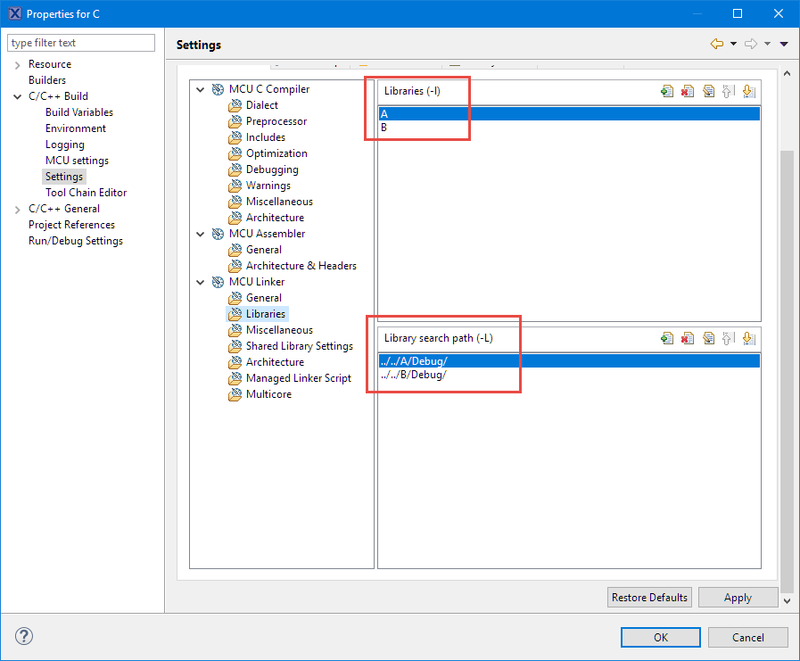 This entry was posted in Building, Eclipse, gcc, KDS, MCUXpresso IDE, Tips & Tricks and tagged arm gcc, Building, CDT, dependencies, Eclipse, Eclipse CDT, gnu gcc, Kinetis Design Studio, libraries, NXP, Other Objects, Referenced Projects, software, software project, technology, Tips&Tricks by Erich Styger. Bookmark the permalink. Great post! Have been lookig for this. How do you do dependency magement in source code management tools like git? Having separate repositories and thus separate projects is the modular approach and allows to perform exactly what you described here. But this requires the developer to specify which branch and commit should be used for building Project C – and this becomes a mess in my experience. There are other ways, like git submodules or committing binaries. Did you ever solve this “issue of dependency management”? thanks :-). I usually do not separate things out of repositories. Instead, I have the project(s) in the repository and do the dependency inside. 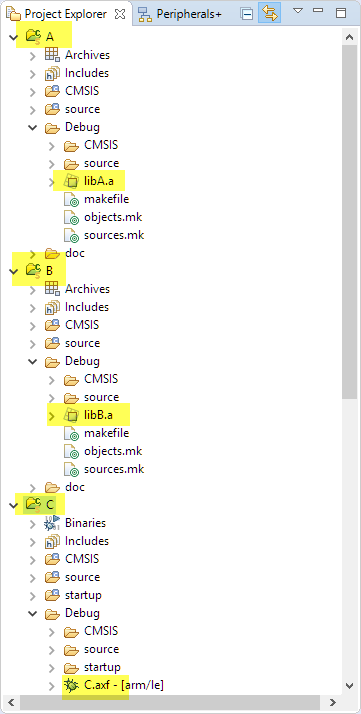 And if using different branches/tags in parallel, I simply can clone the repository into multiple directories. I have not used submodules, as I have not needed them (I rather would split the repository then). But this is just me, others will see this differently I think. For more complex repository setup, I run a script file which does the checkout/etc for me. 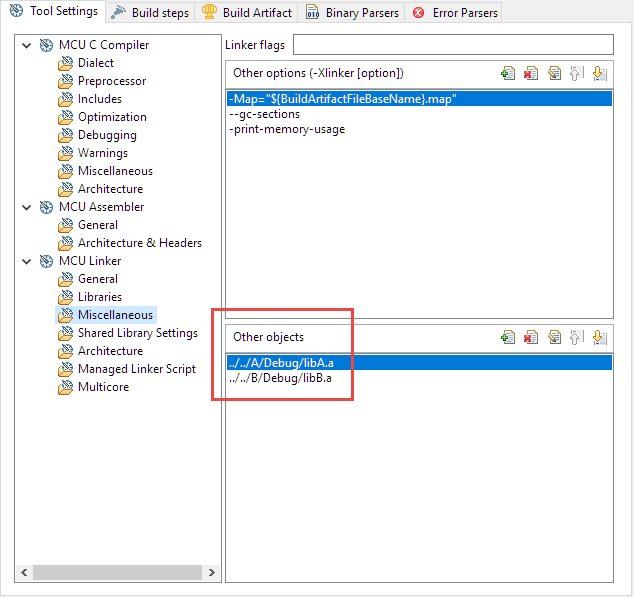 I think a post on SVN/git management for embedded projects in Eclipse-based IDEs would be interesting. There are many on line, but I am curious of the DEV perspective instead of the IDE producers one. I agree with Luca. It’d be very interesting to hear how you solved this conundrum. Especially once a big(ger) team starts working on embedded Software you really start to miss a proper package manager for embedded applications. Nugets and the like are great, but not really suitable. I think this whole issue doesn’t get the attention it deserves. Everyone seems to be either reinventing the wheel with every new embedded project or has trouble managing/versioning common libraries. Writing portable code for most embedded applications might be harder, but is far from being impossible. What I have been using sucessfully is using the components/package manager of Processor Expert: I can create software packages, distribute them on a VCS and have it used by the team. You might have a look at CMSIS-Packs (https://mcuoneclipse.com/2016/02/14/are-arm-cmsis-pack-the-future-of-software-components/) too. That approach could work for you too, although I have stopped using it. firstly, I’d like to congratulate you on your work here at blog and for your effort on disseminate information. I’ve recently migrate to MCUXpresso and I’m having problems adding features to my existing project (e. g. lwIP, USB Stack MSD FATFS…). I’ve managed to workaround the first struggle by copy my project on top of the example project of lwIP, and it worked. But, now I’m not able to do this anymore with the USB Stack. it seems to me that the issue in https://community.nxp.com/thread/461849 is resolved and was because of wrong directory structure? I’m not sure what problem you face with the USB stack, but I suspect it might be the same problem?